We’d love your help. Let us know what’s wrong with this preview of Speeches of Note by Shaun Usher. 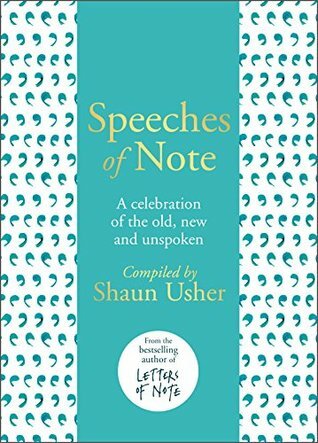 From Shaun Usher, the author of the international bestseller Letters of Note, comes an obsessively curated, richly illustrated and sumptuously produced collection of speeches from throughout the ages. Discover speeches that altered the course of history, like Nelson Mandela’s on the day he b SPEECHES OF NOTE: seventy-five extraordinary ways to step into someone else’s shoes. To ask other readers questions about Speeches of Note, please sign up. Speeches given and not given, world-changers in many ways. I adored the two 'Letters of Note' books, and was always going to try this when I saw it released. A seemingly random collection, this time of speeches, from modern times and further back in human history, from all around the world. Some famous names, some not so well-known. But some absolute gems that leave you speechless (pun intended), some that inspire and uplift, some that help put history into context. I accessed the text as an audi Speeches given and not given, world-changers in many ways. I accessed the text as an audiobook, which really is how a speech is intended to be received, and of course, the speakers of almost every offering are no longer with us, so the publishers have assembled a collection of readers to stand in for them. I thought almost all were excellent - elder statesmen's voices for politicians, young voices for the children reading, for example - I only had trouble making out all the words spoken by those reading English with a couple of foreign accents. A few in particular had me in tears, and though I did skip one or two that didn't interest me, on the whole I was rather riveted. Some of the most mesmeric were those never spoken - the 'failure' speeches of the Normandy beaches, of the moon landing. Those given by children - a girl pleading to the UN to protect the environment, a teenage boy with AIDs talking of the ignorance surrounding his condition - I was walking along shaking with tears at these. A number were actual recordings of the real speeches, such as a young Justin Trudeau on the occasion of his father's funeral. All but one of these were clear enough to listen to comfortably. And there were some that had me laughing as well - a full range of human emotion experienced at the hands of a cross-section of humanity. While I read 'Letters of Note', this is a book I would recommend listening to, despite a minor number of speeches I had troubling listening to due to clarity issues. I would have liked, rather than 'chapter 1', the name of the speaker in the contents, to aid in searching if wanting to find a particular speaker. I would also be interested in Usher's reasoning for his chosen order of speeches, I could see no pattern in their layout. Powerful stuff. Lots of interest in background detail of many contemporary and older historical events. I recently received this book in the mail and I have to say I was super excited! Speeches of Note is a collection of Speeches from different parts of history, from Elizabeth 1 to Malala. It includes untold speeches (for example a speech that Nixon was to use if Neil Armstrong and Buzz Aldrin didn't make it back from the the moon) as well as some more well known ones, like Nelson Mandela’s speech when he became president of South Africa. There’s something to spark anyone’s interest. Some are lig I recently received this book in the mail and I have to say I was super excited! Speeches of Note is a collection of Speeches from different parts of history, from Elizabeth 1 to Malala. It includes untold speeches (for example a speech that Nixon was to use if Neil Armstrong and Buzz Aldrin didn't make it back from the the moon) as well as some more well known ones, like Nelson Mandela’s speech when he became president of South Africa. There’s something to spark anyone’s interest. Some are light hearted and amusing, others are fervent, intense and heartfelt, bringing important issues to light. It is sso good. I haven't been in tears since I was about fourteen years old when my parents decided to move across town and leave me with brother and grand uncle. The speeches are amazing. I am now an Irish nationalist (a fan of them!!!!!) after reacding some of the speeches. Interesting look at some of the speeches that have changed the world and cover such subjects as slavery, feminism and racism. Just like any collection of works I liked some better than others but a good audiobook nevertheless. Not as good as previous Letters of Note but still some really interesting speeches.